We want to organise the fall version of 5 days 5 stories. It’s especially interesting because it’s the beginning of the very seasonal ﬂoristry in autumn, Christmas and winter. The “PLUS part” uses elements of the “identity-seminar” the dominant part is the lecture/demonstration of Gregor Lersch and his team partners. A new factor is also the “styling and shooting” lesson, for the photography by Gregor Lersch and a photographer-expert. One of the evenings will be an autumn lights party and festive diner. 1st day: seasonal materials and techniques in autumn-ﬂoristry – compositions and arrangements. 2nd day: fall bindings: bouquets and all techniques of binding, knotting, weaving, winding in various works. 3rd day: advent days intensely developed craftsmanship and ideas for the quiet time before the Christmas holidays. 4th day: the “high-time” Christmas ﬂower design. The magniﬁcent and festive ﬂoristry for the peak of the holidays. 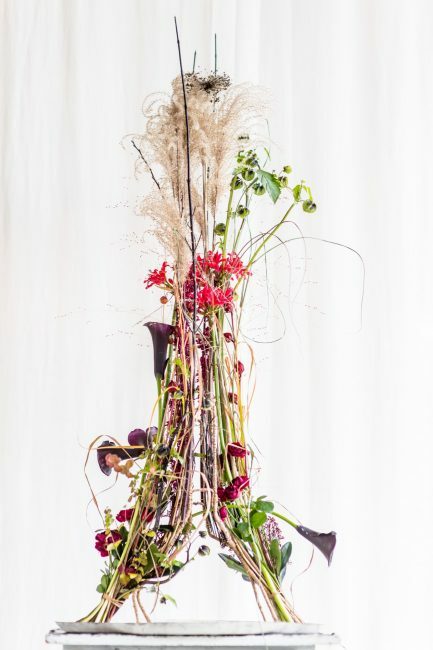 5th day: quiet winter designs with very natural materials with ﬂowers and also plants for the start in the year. Studies of vegetative designs and asymmetry.